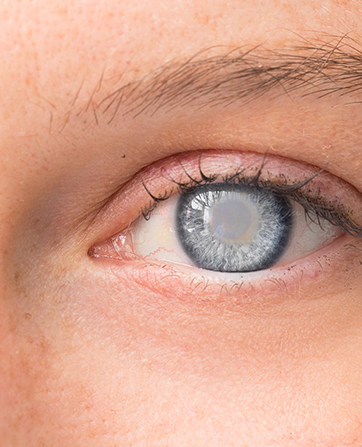 Cataracts are a clouding of the lens in the eye, affecting the vision and causing blurriness. This common eye condition is typically associated with older adults, in fact, more than half of all Americans over the age of 80 either have cataracts or have had cataract surgery. If you’ve noticed your vision has become increasingly hazy, dim, or blurry and you aren’t experiencing any eye pain, you may have cataracts. The eye’s lens works hard to help us focus on people, things, landscapes, and anything else in our path. As we grow older, this lens can harden or stiffen, making it difficult to focus. Since the lens is no longer as flexible, pliable, or clear as it once was, the eye may have a hard time focusing light as it should. Even though cataracts are most often linked to old age, it can also occur as the result of other common eye diseases. Less common causes of cataracts include heredity, birth defects, chronic diseases like diabetes, excessive use of steroids, and injury to the eye. The best way to catch cataracts in its early stages is to have a regular eye exam at least once a year. By seeing your eye doctor on an annual basis, he or she will be able to monitor the health of your eyes, making note of any areas of concern. Unfortunately, there is no way to prevent cataracts from forming. However, there are a handful of things you can do in order to slow the disease. Protecting your eyes from direct sunlight, monitoring blood pressure, quitting smoking, and avoiding excessive alcohol intake are all ways to protect your eyes from cataracts. More than 22 million Americans over the age of 40 are dealing with cataracts, and that number is projected to reach 30 million by 2020. Staying on top of your eye health and reporting any changes in vision to your doctor is important, especially for older Americans. To schedule an appointment for a comprehensive eye exam or to learn more about cataracts, please contact the nearest First Eye Care location to you today.